It’s that time of year! By now, you likely have begun decorating for Christmas in one way or another. Maybe your tree is up. Maybe your stockings are hung by the chimney with care. And maybe you’re planning an outdoor Christmas light display. One of the most common places to decorate for Christmas is the roof. Of course, those twinkling lights and decorations look great, and they give you a shot at winning the title of the Jolliest House on the Block. 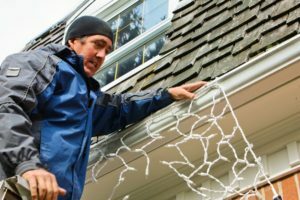 However, if you aren’t willing to trade the integrity of your roof for this claim to fame, here are a few things to keep in mind so you can decorate for Christmas without damaging your roof. Staples are quickly becoming a thing of the past when it comes to decorating for Christmas. However, plenty of people still use them. The damage staples can do to your roof is far more than just a cosmetic concern. You may think that the puncture from a staple is too small to do any damage, but unfortunately that’s just not true. Even the tiniest holes in your shingles are big enough for water to gradually seep in. If that water is allowed to freeze, it expands and creates larger holes, leading to even more damage. Even above freezing, the water will eventually make its way into the vulnerable parts of your roofing. That means that your roof will weaken over time, which means a lower lifespan of one of the most important parts of your home. Usually, if you’re stapling lights or other decorations to your roof, you’re not just using a couple of staples here and there, you’re using hundreds. And that’s just for one year! Tiny holes from repeated stapling will limit the lifespan of your roof considerably. Asphalt shingles will lose granules much more quickly than normal, and the wood underneath can warp or rot. Even if water itself doesn’t damage the wood under the shingles, it can create continuously moist conditions and lead to mold and mildew growth. In addition, all of these little holes can eventually lead to air transfer, which means lower efficiency and higher energy bills. Metal Staples Don’t Play Nicely with Electricity. 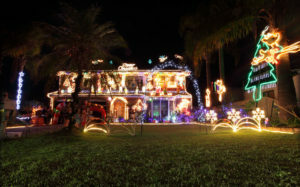 Many Christmas lights are cheaply produced, so it’s not rare for a string of lights to have exposed wiring and a casing that’s vulnerable to the elements. This exposed wiring, in combination with metal staples, is a dangerous combination when it’s on your roof (or anywhere, for that matter). As you probably remember from high school science class, metal is a great conductor of electricity. That’s why it’s inside of all of these wires. Electricity doesn’t just move along the wires, though. If an electric current isn’t completely encapsulated, it could be allowed to transfer to the staples, and inevitably into your roof or along your gutters. That’s just not worth the risk. Use Anchors and Clips Instead of Staples. Luckily, staples aren’t the only method of securing your festive display. A safer alternative to staples are plastic roof clips that can be attached to gutters or shingles. Unlike metal staples, plastic will not conduct electricity, and the clips do not need to puncture your shingles to be effective. Some types of clips can even be left on the decorations, so they’ll be ready to go for next year. With a little ingenuity and planning, you can likely anchor almost any decoration to your roof in a safe way with anchors, clips, or ties. Don’t Put Too Much Weight on the Roof. Pay attention to the weight of the decorations you’re using. A couple inflatable reindeer is probably ok, but if you’re still using those heavy displays from the ‘90s, make sure you’re taking their weight into account. It’s easy to justify “just one more thing,” but the weight (even if it’s only a few pounds) can really add up. Putting too much weight on your roof can begin to stress the shingles, supports, and other structures on your roof. Add this to the weight of a heavy snowfall, and you might be doing some serious damage under all of those twinkling lights. Decorate Your Lawn Instead of Your Roof. Worried the Damage Is Already Done? So can you decorate for Christmas without damaging your roof? You bet! But what if you think the damage is already done? Don’t worry. We can help with that, too. If you’ve been putting up a heavy display and using metal staples for years, it’s probably time for a roof inspection. We’re proud to be able to offer a free roof inspection – just click here to schedule. We’ll be happy to take a look at your roof and offer our expert advice. Happy decorating!